The Nov. 6 midterm elections will decide many important races, but perhaps one of the toughest decisions facing Noblesville voters is whether Noblesville Schools should receive $50 million over eight years to pay for increased teacher salaries and safety enhancements across its 10 schools. Noblesville Schools has had no problem passing referenda in the past, and while the district and its political action committee, MillerYes, are focused on educating the public of the facts, some parents and taxpayers in the school district are skeptical of the need for an additional $6.25 million annually. Julia Kozicki, who serves on the Noblesville Schools Board of Trustees, is the chair of Miller Yes. She has children who are students in the district and said passing the referendum is critical to keeping Noblesville Schools excellent. George Hodgson, a Noblesville resident since 1982, and whose three children attended Noblesville Schools, said he has long supported the district, but doesn’t believe the district has a clear enough plan for implementation of new safety initiatives and does not support the passing of the referendum. Hodgson also said he believes many of the physical safety changes in the school buildings are reactive and that a more serious look at metal detectors would better serve as a deterrent than gun-detecting dogs or metal-detector wand screenings done at random or where reasonable suspicion exists. What will the question look like on the ballot? Voting yes would approve the tax increase. What does approval mean for the existing referendum? In 2016, Noblesville voters passed a referendum for education programming and staffing that the district has long said was to keep the “status quo” as it and other districts in affluent areas of Indiana continued to see a decrease in state funding. According to Noblesville Schools, approximately $46.5 million has been cut from its funding since 2009. If the referendum passes, it would replace the 2016 referendum. Taxpayers would not be paying for both. However, the rate of the 2016 referendum is approximately half of the proposed referendum and will mean a tax increase for Noblesville residents. How much would a household pay? The existing referendum rate is 18.9 cents per every $100 of a home’s net assessed value, after tax deductions are taken into account. The referendum on the Nov. 6 ballot would increase the rate to 37 centers per every $100 dollars of a home’s net assessed value, after tax deductions are taken into account. For example, a home with a gross assessed value of $100,000 would pay approximately $120 each year. The referendum amount would be in addition to the home’s regular property taxes, and everyone in the Noblesville Schools district would pay, which is where much of the criticism strems from because not all those living in the district have children who attend its schools. However, Kozicki said even for households where Noblesville Schools students aren’t present, the referendum is an important investment. A tax-impact calculator is available at milleryes.org/taximpact2.html. 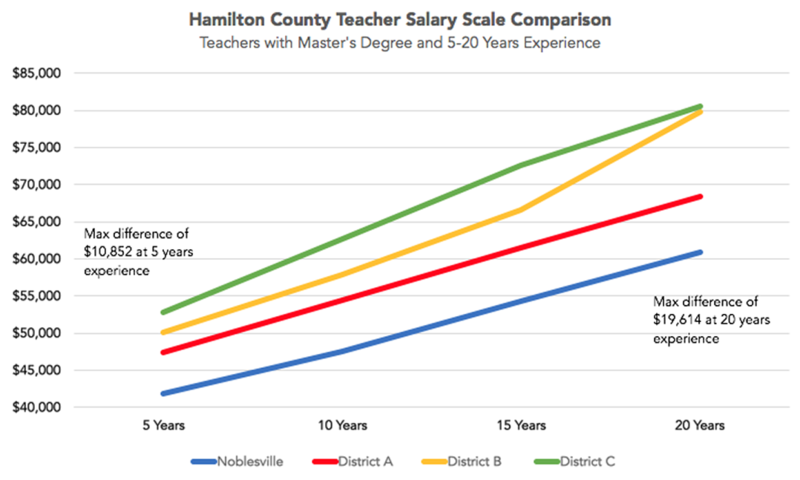 The graph shows the teacher salary differences between Hamilton County’s four major school districts — Carmel Clay Schools, Hamilton Southeastern Schools, Noblesville Schools and Westfield Washington Schools. How do teacher salaries play a part? Safety changes will take up a slight majority of referendum dollars, but 47 percent will go to address teacher salaries, attraction and retention. 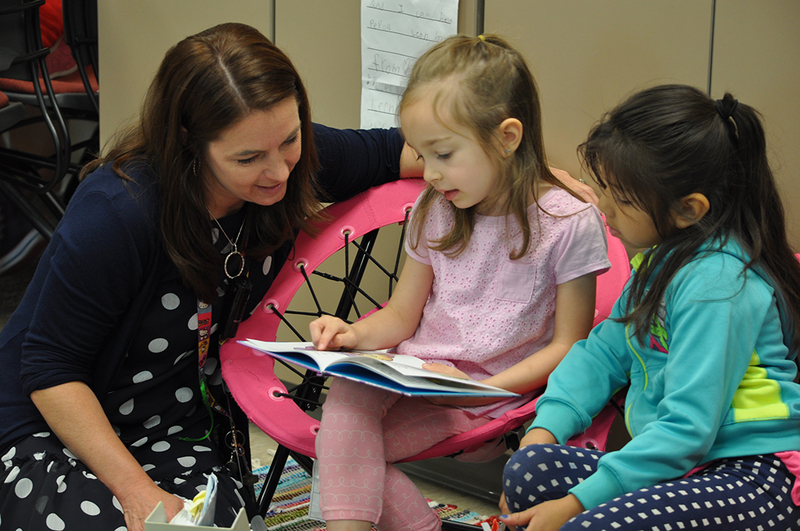 A state and national teacher shortage is affecting Noblesville Schools and school districts in the area. During the past couple of years, those districts have increased teacher pay, but Noblesville has not kept up. This is one part of the referendum Hodgson said he supports but is skeptical that the additional funds would fix the problem. District officials have said, in some cases, teachers have cited salary as a reason for leaving. One example from the district shows a teacher with 11 years of experience making above $20,000 more each year at a neighboring district. “Even before May 25, we were already recognizing the impact that increased referenda in our surrounding districts were having on teacher pay, and we were beginning the process as a district how we were going to address the discrepancy in teacher pay, particularly in the mid-range years,” Kozicki said. In addition, as class sizes continue to grow, Noblesville Schools is looking to add more teachers in the middle and high schools with referendum dollars. Approximately 23 new positions would be added in this category. However, Hodgson said he is unsure if it’s the job of the school district to handle mental health issues. Kozicki disagreed, saying students need the additional support in today’s world. Early voting began Oct. 10 and can be done by visiting the Hamilton County Government and Judicial Center, 1 Hamilton County Sq., Noblesville. Hours for early, in-person voting at the courthouse are 8 a.m. to 4:30 p.m. Monday through Friday. Ballots also can be cast on two Saturdays before the election, from 9 a.m. to 4 p.m. Oct. 27 and Nov. 3. The last day to vote early is the day before Election Day, Nov. 5, from 8 a.m. to noon. On Election Day, Nov. 6, polls open at 6 a.m. and close at 6 p.m.
For absentee or more early voting information, or to find your polling place, visit hamiltoncounty.in.gov/220/absentee-early-voting. The referendum will give Noblesville Schools approximately $6.25 million annually for eight years. The district has said 53 percent of the funding would be spent on mental health and safety enhancements, and 47 percent would be spent on teaching staff and salaries. This, at a minimum, should be 2 separate referendums. Try again some other time. The gentleman is correct, they have ideas, but no concrete plans on how they’ll spend this money. Teachers are pretty much on par with our first responders, who work 12 months a year. Why they keep referring to the gross assessed valuation when your taxes are figured on you net assessed valuation is just more obfuscation. The fact is, for every $100,000 of your net assessed valuation, your tax liability will rise by $181/year. This does not take into account your home’s assessment rising in the future. That also affects all your other taxes: State, county, city, library, etc. All that info is available to see in black and white on your tax statement, the County’s website, or calling the tax office. I saw them touting a tax decrease for last year, when in the real world the actual dollars due went up, due to a higher assessed value on the homestead.